Yellowjackets change their feeding behavior in late summer. No longer the beneficial insect-eating predators they were in the spring and summer, they have become freeloaders, scavenging on fruits, ice cream, beer, and soft drinks. They are aggressive and willing to sting. Yellowjacket management at parks and other public recreation areas, on school grounds, at festivals, football games, and similar outdoor events can be a nightmare. The sheer numbers of yellowjackets are intimidating. And there is so much sweet, rich food to attract them. You can often avoid severe yellowjacket problems in the fall by eliminating workers and nests in late spring and summer when yellowjacket workers are few and their nests are still small. Monitoring is the key. Monitoring--documented and systematic inspections at regular intervals--is a critical part of IPM, and essential for yellowjacket management. Technicians should check around a property at every service visit looking for yellowjacket nests or foraging yellowjackets. Install a few yellowjacket traps (how many will depend on the area) and check them at each visit. Check the traps weekly or biweekly in July and August, if possible, since this is the critical period to head off fall problems. If the traps begin catching yellowjackets, place enough additional traps so that the traps become control tools, reducing the numbers of yellowjacket workers (see trapping discussion below). See if you can track foraging workers back to their nests (see How to Find and Treat Yellowjacket Nests), then mark all the nests you find, and come back at night to destroy the nests when most of the yellowjackets are inside. Do not quit when you find a yellowjacket nest; there may be many more. Keep monitoring and keep looking. Trapping will not eliminate yellowjackets. But aggressive trapping…meaning using lots and lots of traps…will significantly reduce the number of fall-foraging yellowjackets and the risk of stings. 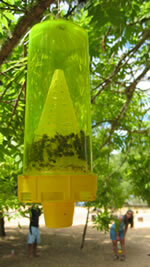 You can choose from many different commercial yellowjacket traps. Some are disposable; most come with bait or bait enhancers. Some traps drown the trapped yellowjackets; others hold them until they die from heat or until you kill them. Don’t limit yourself to one brand of trap or one bait. Not all yellowjacket species respond equally well to all traps or all baits. Different colonies of the same species will even exhibit preference differences. The time of the year also affects bait choice. You will need to experiment with yellowjacket baits and traps to find the most suitable one for a particular site. Place traps according to the manufacturer’s directions. Do not stint; you need lots of traps to get effective population reduction. As an example, say you were working a one-square block festival area with a serious yellowjacket problem. You might need to trap ten or twenty thousand yellowjackets to make a significant impact on yellowjacket foraging. To trap that many yellowjackets successfully, you would need between fifty and one hundred traps. Place the traps around the perimeter of the area you want to protect so that you draw the yellowjackets away from people. Empty traps and change baits frequently (how frequently will depend on the bait) to keep the traps effective. Foraging yellowjackets are attracted to areas where food is readily available. Their numbers and the risk of stings can be reduced, sometimes quite significantly, simply by changing trash and food management practices. Although yellowjackets are not the first pest to come to mind when thinking IPM, they are actually very susceptible to the IPM approach. Fall yellowjacket problems at outdoor events, in fact, can only be successfully managed through IPM. Insecticides alone will have little effect. Aggressively clean up food spills around picnic tables and other eating areas. Police the grounds frequently, picking up food trash. Empty garbage cans at least daily, and ideally whenever they become full. Tie off the trash bags. Use heavy plastic trash bags that do not tear easily. Wash down trash cans regularly, inside and out. Use a mixture of household ammonia and water to spray surfaces with sugary food residues. Move dumpsters away from high-traffic areas and critical areas; have them emptied often and power-washed regularly. Make sure lids are kept closed. If dumpsters overflow, schedule more frequent pickups. Wash down the dumpster pad so it is free of grease and leakage. Wash down outdoor soft drink dispensers regularly to remove sugar residues. Also hose down the surrounding area to eliminate spill residues. Serve soft drink cups with tops and straws (this will also reduce the number of stings around the mouth and face). Dispose of empty soft drink and juice cans away from sensitive sites and in trash cans with tight fitting lids. If necessary, install cans with self-closing lids. Eliminate standing water and leaky spigots, etc. outdoors, or at least make sure the water is not in a sensitive location. If yellowjackets are attracted to water from lawn sprinkler systems, change watering times to minimize people/yellowjacket contact. Avoid landscaping with late-blooming plants--those that bloom in the summer or fall, or at least plant them away from critical sites. Clean up fallen fruit under fruit trees and rotting vegetables in gardens.